This universal line voltage medium screw base LED bulb is specially designed as a direct replacement for most 40W to 60W incandescent bulbs. 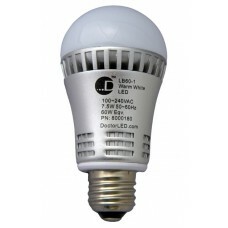 It is a high-quality, high-power LED bulb that is the perfect way to reduce energy consumption in your home with energy consumption of only about 7.5W. It comes with a standard medium screw base and works just like your regular bulbs. Replaces most 60W incandescent bulbs. Universal line voltage: 100 ~ 240 VAC. Very low power consumption (approximately 7.5 W). NOT DIMMABLE. This bulb does not work with electronic dimmers.